You need to be aware of the increased health risks of migraine stroke and heart attacks... it could save your life! This evidence is based on a long term study called The Physicians Health Study that started in 1982 at Harvard and has continued on. Some studies are small, but this one has over twenty-two thousand doctors that have been followed for more than thirty years (at present date). Different studies start and stop, but they continue to monitor health. Many were/are migraine sufferers. The results showed that these men were more likely to have a stroke and not a heart attack. This study was not conclusive but it did suggest the connection between vascular problems and migraines. It seems since then, that many studies have been done to better assess the increased risks of migraine associated with increased stroke risk. Individuals with a "history of migraine with aura have a slightly increased risk of stroke." Current research evidence is also finding that "migraine with aura may be associated with an increased risk of cardiovascular disease later in life, too." The links with migraine stroke and aura is still unclear, as are the many mysteries that remain around migraines. Studies have also shown that people with migraines may also experience other health problems like: "high blood pressure, diabetes, or other things that increase the chance of heaving heart disease or stroke as well." So, the bad news is that there are many other health problems to consider as well as increased migraine stroke risk. Perhaps knowing this will help you take better care of your health and yourself overall. The increased risk of migraine stroke has been in my awareness for years, yet I still feel unprepared and somewhat terrified. Face drooping does not accompany migraines. 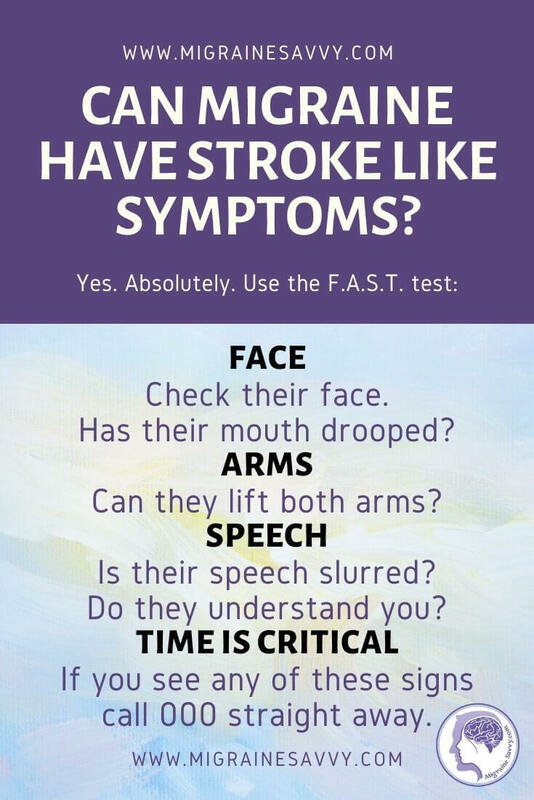 The signs and symptom of stroke can resemble migraine and vice versa. 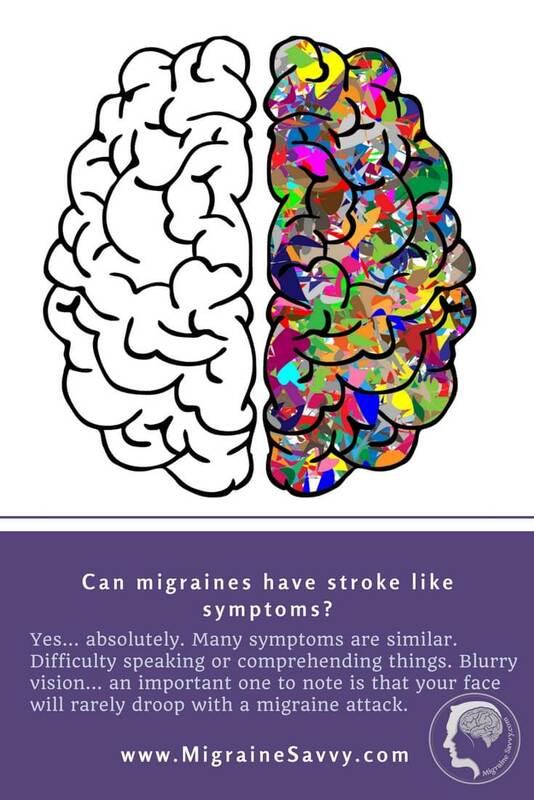 So differentiating between the two may be very difficult for you if you get regular migraine attacks. Loss of movement on one side of your arm or face, is the most well-known symptom. One sided weakness or numbness is also common. The telltale sign is that these all happen suddenly. One sided tingling or impaired leg movement. Confusion around speaking and understanding words. Any severe head pain that feels different in some way to your previous migraines. Having said that, they do not all have to be sudden, they can occur more slowly. For more details, please read the article on migraine stroke symptoms. 1. Do not smoke. This is a no brainer! This will definitely increase your risk of stroke and heart attack. If you are addicted to nicotine and all the other nasties in cigarettes, go get help now. 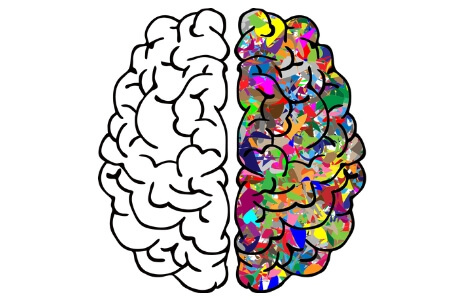 The technique called NLP – Neuro Linguistic Programming is reported to be most the effective therapy to help you stopping smoking. This is essential to reduce migraine stroke risk. F.A.S.T. Face, Arms, Speech, Time. 2. Exercise regularly. Not only does this stir up your good endorphins, and help you feel better, it lubricates synovial fluid in the joints and oils the whole body skeleton and muscles, so to speak. Regular exercise keeps your cardiovascular system running smoothly. 3. Follow a heart healthy diet. Eat smart! Choose the foods you know are good for you. Eat regularly, have a routine so your body knows you will feed it. This will help manage your weight and control your blood sugar levels. Small snacks made up of protein are the best snacks. So have some almonds with your apple or a piece of cheese if that is not a migraine trigger for you. I always have a protein smoothie with rice milk. Stay away from foods high in table salt. That’s a no no! Sea salt is a much better choice. 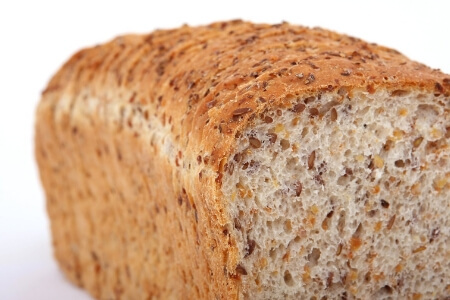 Click here to read my article on - migraine headaches and nutrition. 4. See your doctor regularly. They can keep track of your blood pressure and cholesterol levels. This is important. 5. Take a low dose aspirin or baby aspirin. Your doctor may feel you are a candidate for daily low-dose aspirin. If you already have a history or heart disease or stroke, aspirin might help. It does have side effects though like stomach ulcers, so do your research, you don’t need to add problems to the mix. 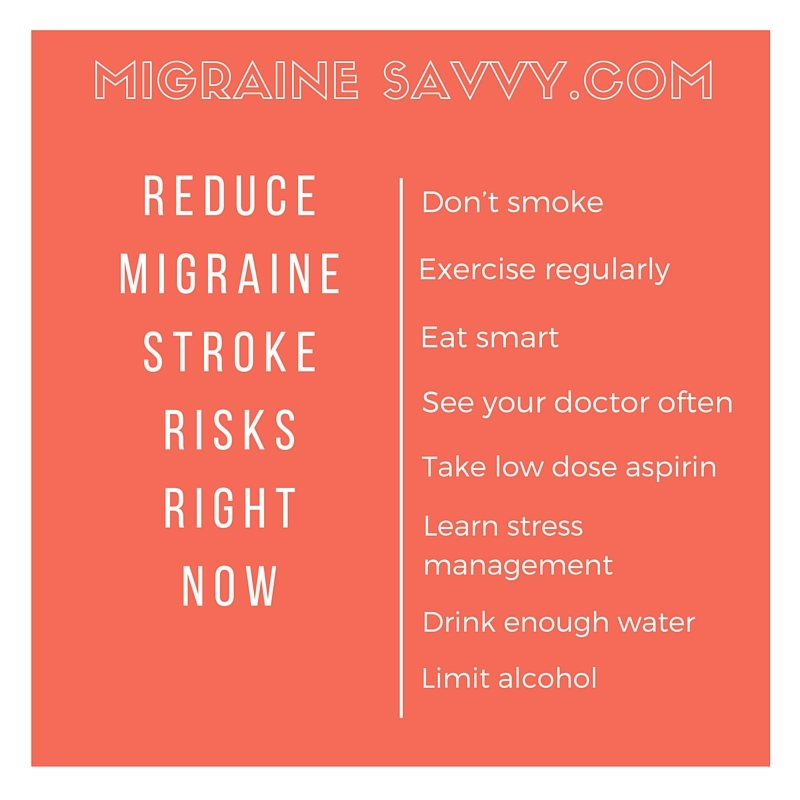 You want to reduce migraine stroke risks... not add to them. 6. Drink lots of water. Sip on 8 glasses a day of natural spring water. It will just help your body in more ways than we can count! 7. Limit alcohol consumption. Another no brainer. You may already stray away from alcohol as a migraineur, but I had to add this one. 8. Learn stress management techniques to help reduce migraine stroke risk. I've written a book to help with reducing anxiety and stress. Knowing what to do and taking action reduces anxiety. 9. Manage your sleep cycle. Quality and quantity matters. Getting 8+ hours solid sleep each night will help your body go through all the detox and healing, rejuvenation and repairing it needs to do. 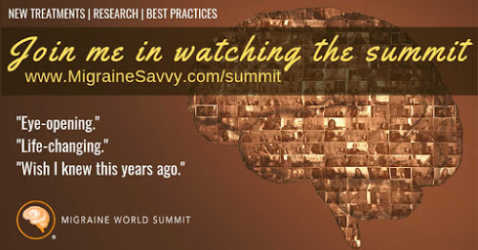 Andrew Levy, author of A Brain Wider Than The Sky: A Migraine Diary, says that researchers all over the world argue over the stroke risk associated with migraines. 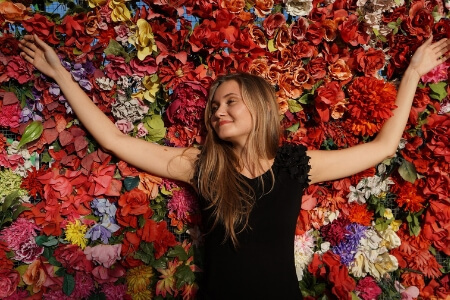 The statistics are small but significant: 15/1000 (1.5%) of women without migraine experience strokes and 30/1000 (3%) of women with migraines will experience a stroke. Scary to me as all of these statistics apply to me. I am a woman, over 45, migraine sufferer for over 25 years. He refers to the actress Sharon Stone, who "mistook a brain aneurysm for one of her frequent migraines, and now warns migraineurs to pay close attention to any headache that doesn’t feel like the usual banging." The point here is that if anything seems out the ordinary for you, be aware. Make sure you tell your close family members to watch for the signs of stroke, and tell them about increased risks for you with having migraines. I couldn't help myself, here is a summary and reminder for you. Doing yoga, learning to meditate, or doing anything you love that takes you away from stress is a good form of stress management. So you don't have to meditate like Buddha if you don't want to. Stay in touch... join the mailing list and get 5 things you can use right now to help combat migraines. 1. Rizzoli, P. MD, Loder E., MD and Neporent L. (2011) The Migraine Solution: A complete Guide to Diagnosis, Treatment, and Pain Management. St. Martins Press: New York. pp. 111-113. 2. Levy, A. (2009) A Brain Wider Than The Sky: A Migraine Diary. Simon & Schuster, New York, NY. p. 188.